Resembles Long-eared, but occurs in open ground (Long-eared mostly seen among trees). Flies with slow, elegant and high wing-beats on long, slender wings raised during glides in shallow ‘V’ (shorter wings with shallower, faster wing-beats in Long-eared); often sits on ground and very short ear-tufts not always visible. 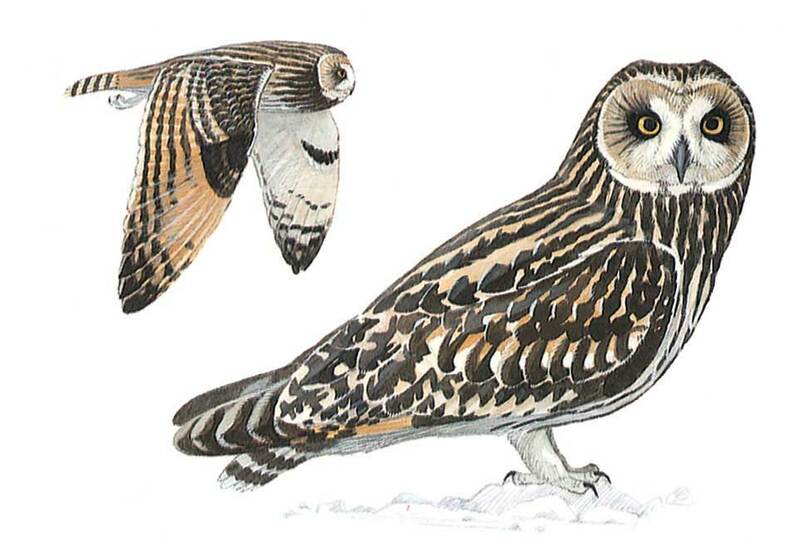 Further differs from Long-eared in paler greyish facial disc (not warm buff and white) with striking black surround to glaring yellow (not orange) eyes; greyish brown (not rufous-buff) plumage mottled blackish. In flight, separated from Long-eared by yellow-buff (not orange) base of primaries, more contrasting bars on flight-feathers and tail, white trailing edge to upperwing, black tips to underwing (not diffusely barred) and dark streaking on underparts mostly confined to breast and contrasting with paler belly. Often hunts in daylight.